It would surprise most of us, if I say that the Indian Currency is one of the root-causes; why Indian Economy is suffering from black money, corruption etc. To be precise, the currency-notes above Rs. 50. We people normally consider Economics to be a complex topic better left to the experts. But certain simple things about it are needed be known by everyone – at least the tax-payers. Let us take an example of US Economy! In US, per capita income is 40,000 USD and their maximum currency “bill” is 100$. In other words, an average American earns 400 times his biggest currency bill. In countries like UK and Japan also, similar ratio has been maintained. However, in India per capita income is Rs. 23,000 and the biggest currency bill is 1000 Rs. That is, the ratio for India is as low as 23!!! This ratio facilitates creation of black-money. Due to the higher currency-notes, it is possible to transact huge sums of money in cash. The cash transactions can be very easily left unaccounted, thus helping immensely the black-money to foster. In India, nearly 80% of the transaction happen through cash. In developed countries, nearly 90% of the transactions happen through banks !!! Lets see how serious the repercussions can be. On 11-Sept, 2001 World Trade Center was attacked by Al-qaeda. In another 3 months, on 13-Dec, 2001 Indian Assembly too was attacked by Lashkar-e-Taiba. After 9/11, USA could cease the accounts of Al-Qaeda successfully as majority of the transactions in that country happen through banks. On the contrary, India could not weaken LeT to the same effect, since India has a parallel channel of transactions – through cash!!! US had similar problems with black-money in 70’s. President – Richard Nixon – then canceled all the currency above 100$. Similar, is the situation of India (with two Economics scholars holding up prime-ministerial and home-ministerial positions!). So a similar decision should be taken in the interest of the nation. A similar simpler solution is possible for the Indian Tax System. In general there are many loopholes in the tax system, which leads to evading from Tax payment. Due to this, government tries to incur Indirect Taxes wherever possible, rather than direct taxes. An Indian citizen – without his knowledge (due to the indirect Taxation) – normally pays about 30-32 types of different taxes. Indeed, Tax System is very complicated and incomprehensible e.g. A television-set costing Rs. 5000 in Mumbai, may cost Rs. 5500 in some nearby town (like Nasik), and say Rs. 4500 in some other state, since the sales-tax structure is different in different places. So the same commodities are sold at different rates in different parts of the same country. This triggers black-markets. 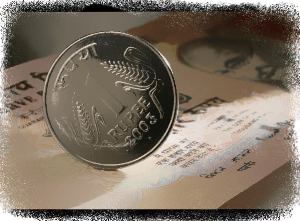 Moreover, our own rupee is valued differently in different parts of the country! To overcome this, Mr. Bokil has proposed a simple and effective taxation system. It proposes to eliminate the existing taxes incurred at various levels like Central, State or Local level (except the import duties which are applied on the international transactions). Instead, government should apply a specific amount of tax on all transactions happening through bank. 2. To spare the underprivileged from the bracket of taxation, the cash transactions would be non-taxable. (This goes with the first part of article, which emphasized using smaller currency bills, ensuring the possible cash transactions do not involve large sums). To strengthen the concept further, Government should enforce all transactions above a certain amount (say Rs. 2000) only through banks (Cash transactions would be invalid/illegal). This would increase the bank-money, and the capital in market. India has lot of money, but doesn’t have as much capital. So, thus goes the message of “Artha-Kranthi” – a concept, conceived and promoted by Mr. Bokil and his peers. The message has started catching its roots, among Commons and Lords alike. Hon. President Mrs. Pratibha Patil commented “It will be the happiest moment of my life, when I sign on this bill”.